The Phoenician 's were seafaring over one millennium BC. The folks were not the mutts we we taught about in the public schools system. History continues to amaze me..The truth of it that is. Hand made vessels that sailed the seas, these people had courage Inc & knowledge not spoken of by the authoritarian educational system. there are more mystery's on the earth than in all the heavens. We aren't privy to them. Seems to me we are on a par with mushrooms- kept in a closet and fed Sh**t.
The govs and elite have the real deal well hidden. Think Vatican Vaults for a second, one of the most secure areas on earth. WHY? JERUSALEM, ISRAELâ€”A member of the Israeli Caving Club discovered a cache of valuable objects while exploring a stalactite cave in northern Israel and reported his find to the Israel Antiquities Authority (IAA). 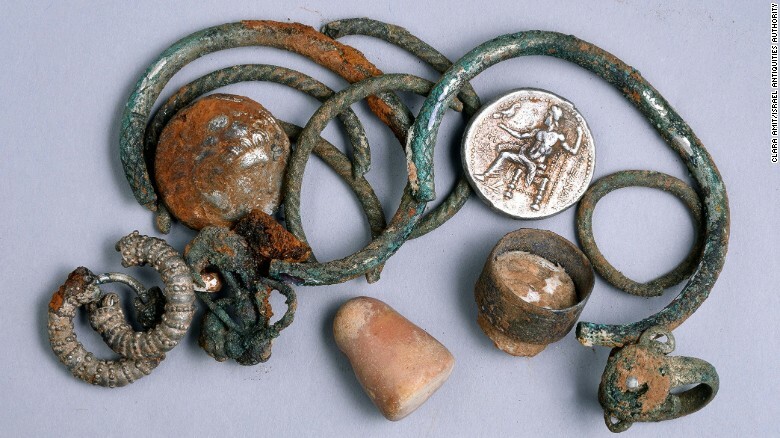 Two silver coins minted during the reign of Alexander the Great; silver signet rings, bracelets, and earrings; and eight white and black agate beads stored in a small clay oil lamp are thought to have been placed in a cloth pouch before being hidden in a niche in the cave. â€œThe valuables might have been hidden in the cave by local residents who fled there during the period of governmental unrest stemming from the death of Alexander, a time when the Wars of the Diadochi broke out in Israel between Alexanderâ€™s heirs following his death,â€� according the a statement made by the IAA and reported by CNN. The two silver coins were minted during the reign of Alexander the Great, who conquered the region in the late fourth century B.C. On one side of the coin is an image of Alexander the Great, while on the other side is an image of Zeus sitting on his throne, arm raised as if ready to wield his fearsome lightning bolts. The coins allowed archaeologists to date the find. The Wars of the Diadochi (or Wars of Alexander's Successors), (Greek: Πόλεμος των Διαδόχων, Polemos ton Diadochon) were a series of conflicts fought between Alexander the Great's generals over the rule of his vast empire, after his death. They occurred between 322 and 275 BC. When Alexander the Great died (June 10, 323 BC), he left behind a huge empire that was in essence composed of many independent territories. Alexander's empire stretched from his homeland of Macedon itself, along with the Greek city-states that his father had subdued, to Bactria and parts of India in the east. It included Anatolia, the Levant, Egypt, Babylonia, and Persia. Cleopatra of Macedon (Greek: Κλεοπάτρα; c. 357 BC â€“ 308 BC), or Cleopatra of Epirus, was an Epirote-Macedonian princess and later queen regent of Epirus. The daughter of Philip II of Macedon and Olympias of Epirus, she was the only full sibling of Alexander the Great. Her other siblings include half sisters Thessalonike and Cynane, and half brother Philip III of Macedon. Diadochi ('successors'): name of the first generation of military and political leaders after the death of the Macedonian king and conqueror Alexander the Great in 323. To settle the question whether his empire should disintegrate or survive as a unity, and, if so, under whose rule, they fought four full-scale wars. The result, reached by 300, was a division into three large parts, which more or less coincided with Alexander's possessions in Europe, Asia, and Egypt. During the next quarter of a century, it was decided whether these states could endure. As it turned out, there were no great territorial changes, although there were dynastic changes. After 280, the period of state-forming came to an end. Just when the situation in the hellenistic empires seemed to be stabilized, the Galatians invaded Greece. The deepest cause was the collapse of the kingdom that had once been Lysimachus': when this king was killed in 281, the tribes in the buffer zone in the north sided with the barbarous Galatians, who now found the way to the south open. These Galatians belonged to the La T�ne-culture, which is often called 'Celtic'. The story is told by Pausanias (Guide for Greece 10.19.4-23.9); his source may or may not be Hieronymus of Cardia. The translation was made by Peter Levi. The Galatians were a Celtic people that dwelt mainly in the north central regions of Asia Minor or Anatolia, in what was known as Galatia, in today's Turkey. In their origin they were a part of the great Celtic migration which invaded Macedon, led by Brennus. The original Celts who settled in Galatia came through Thrace under the leadership of Leotarios and Leonnorios c. 278 BC. These Celts consisted mainly of three tribes, the Tectosages, the Trocmii, and the Tolistobogii, but they were also other minor tribes. They spoke a Celtic language, the Galatian language, which is sparsely attested. In the 1st century AD, many of them were Christianized by Paul the Apostle's missionary action. One of the Epistles of Paul the Apostle in the Bible (New Testament) is addressed to Galatian Christian communities (Epistle to the Galatians). According to the Hebrew Bible, Galilee was named by the Israelites and was the tribal region of Naphthali and Dan, at times overlapping the Tribe of Asher's land. However, Dan was dispersed among the whole people rather than isolated to the lands of Dan, as the Tribe of Dan was the hereditary local law enforcement and judiciary for the whole nation. [non-primary source needed] Normally,[when?] Galilee is just referred to as Nafthali. Jesus Christ, also called Jesus of Galilee ... Jesus was a Galilean from Nazareth, a village near Sepphoris, one of the two major cities of Galilee (Tiberias was the other). Red ochre, Fe2O3, takes its reddish color from the mineral hematite, which is an anhydrous iron oxide. According to some scholars, Neolithic burials used red ochre pigments symbolically, either to represent a return to the earth or possibly as a form of ritual rebirth, in which the color symbolizes blood and the Great Goddess. It appears as if this SNP is a relatively new one in human evolution; one estimate [PMID 17182896] is that the rs1426654(A) allele, in other words, light skin pigmentation, spread through the European population around 6,000 - 12,000 years ago. Prior to that, "European ancestors" were most likely relatively brown-skinned. Another study ([PMID 24048645OA-icon.png]) has concluded that almost all individuals carrying the A111T variant can trace ancestry back to a single person who most likely lived at least 10,000 years ago. ... New analysis of ancient European genes shows that other traits we associate with modern Europeans, such as tallness and the ability to digest milk, are also relatively recent additions to the continentâ€™s genetic profile. [T]he new data confirm that about 8500 years ago, early hunter-gatherers in Spain, Luxembourg, and Hungary also had darker skin: They lacked versions of two genesâ€”SLC24A5 and SLC45A2â€”that lead to depigmentation and, therefore, pale skin in Europeans today. But in the far northâ€”where low light levels would favor pale skinâ€”the team found a different picture in hunter-gatherers: Seven people from the 7700-year-old Motala archaeological site in southern Sweden had both light skin gene variants, SLC24A5 and SLC45A2. They also had a third gene, HERC2/OCA2, which causes blue eyes and may also contribute to light skin and blond hair. Thus ancient hunter-gatherers of the far north were already pale and blue-eyed, but those of central and southern Europe had darker skin. A new study has revealed that humans living in Europe had dark skin for the majority of the time they have inhabited the continent. The study, presented at the 84th annual meeting of the American Association of Anthropologists (AAAS), suggests that many of the characteristics associated with European genetics are a recent development in the broader history of human evolution and migration. Led by Dr. Iain Mathieson from Harvard University, the international team of researchers analysed 83 human gene samples collected as part of the â€˜1000 Genomes Projectâ€™ (an initiative designed to sequence the genomes of a large number of people and allow public access to the data for scientific research). Focusing on two genes, SLC24A5 and SLC45A2, which are responsible for de-pigmentation and pale skin, the team studied samples taken from a wide range of ancient populations spread across different periods and different locations. In northern Europe however, the situation seems to have been different. Remains studied from Southern Sweden were found to have the gene variants responsible for lighter skin and blonde hair as far back as 7,700 years ago, indicating the inhabitants of Northern Europe had light skin and eyes before the migration from the Near East. The focus of the study was the process and rate of natural selection in Europe. By successfully charting the timing and spread of the SLC24A5 and SLC45A2 genes, the study has raised some fascinating questions. Exactly why the change in skin pigmentation occurred when it did is unclear, while the speed at which natural selection took place was much faster than typically expected. The use of manganese and iron oxides by late Neandertals is well documented in Europe, especially for the period 60â€“40 kya. Such finds often have been interpreted as pigments even though their exact function is largely unknown. Here we report significantly older iron oxide finds that constitute the earliest documented use of red ochre by Neandertals. These finds were small concentrates of red material retrieved during excavations at Maastricht-BelvÃ©dÃ¨re, The Netherlands. The excavations exposed a series of well-preserved flint artifact (and occasionally bone) scatters, formed in a river valley setting during a late Middle Pleistocene full interglacial period. Samples of the reddish material were submitted to various forms of analyses to study their physical properties. All analyses identified the red material as hematite. This is a nonlocal material that was imported to the site, possibly over dozens of kilometers. Identification of the Maastricht-BelvÃ©dÃ¨re finds as hematite pushes the use of red ochre by (early) Neandertals back in time significantly, to minimally 200â€“250 kya (i.e., to the same time range as the early ochre use in the African record). The post above is typical BBC propaganda in trying to justify the existence of the myth that is indo-european language and the so called original migration from the near east when in reality it was the other way around. The Carpato-Danubian cultures of Cucuteni/Trypolie/Karnovo flourised thousands of years before these "indo-europeans" they had their own language and writing, they had cities and trade with the Asia Minor. If you want to know more read the below document. The study looked at the entire span of DNA, or genome, from people from around the world, including a large number from Africa -- where the ancestors of modern humans originated before migrating around the world. The team used sophisticated techniques to compare key areas of each personâ€™s genome to the â€œreferenceâ€� human genome. The findings add to what science already knows about human endogenous retroviruses, or HERVs. Thatâ€™s the name for the ancient infectious viruses that inserted a DNA-based copy of their own RNA genetic material into our ancestorsâ€™ genomes. Theyâ€™re part of the same type of virus that includes the modern human immunodeficiency virus, which causes AIDS. The new HERVs are part of the family called HERV-K. The intact whole viral genome, or provirus, just found was on the X chromosome; itâ€™s been dubbed Xq21. Itâ€™s only the second intact provirus found to be hiding in human DNA. These latter samples showed more signs of HERVs, in line with the high level of genetic diversity in African populations. That diversity stems from the longtime stability and intermixing of the continentâ€™s population â€“ as opposed to other populations in Europe, Asia and the Americas that stem from specific out-migrations in ancient times. CARTHAGE, TUNISIAâ€”Scientists have completely mapped the genome of the "Young Man of Byrsa,â€� a Phoenician who lived 2,500 years ago, and whose remains were discovered outside Carthage in 1994, reports the Independent. The Phoenicians were an influential seafaring people who originated in Lebanon around 1500 B.C. and then colonized much of the Mediterranean, including what is now Tunisia, where they founded Carthage. The team, co-led by University of Otago geneticist Lisa Matisoo-Smith, found that the man had a rare mitochondrial haplogroup that is thought to have originated 20,000 to 25,000 years ago among European hunter-gatherer populations. His DNA most closely matched that of a modern-day Portuguese person, and the researchers speculate that the Young Man of Byrsa's maternal ancestry lay somewhere on the Iberian Peninsula, not in North Africa or the Near East, as might have been expected. They found it contained an extremely rare type of genome sequence, known as U5b2c1, which is almost unknown among modern populations. The research has now been published in the scientific journal Plos One. â€œThis is first example of an ancient Phoenician genome,â€� Professor Lisa Matisoo-Smith, co-leader of the study, told The Independent. The DNA was found on the site of Byrsa, a citadel close to the ancient city of Carthage, which now just outside Tunis, Tunisia. To find European lineage in North Africa dating from 2,500 years ago was â€œvery unexpectedâ€�, the professor said. The scientists were expecting to find DNA of indigenous North African lineage, because of the location, or from the Near East, because of the history of Carthage. â€œThis is the earliest European lineage recorded in North Africa, so in a way it not only helps us understand Phoenician history, but also makes people [re]think about the history of human mobility,â€� said Prof Matisoo-Smith. Similarly to Roman Britain, although several hundred years earlier, the research shows Phoenician cities were diverse and often moved with trade networks. Coliboaia Cave (Romanian: peștera Coliboaia, pronounced [koliˈbo̯aja]) is located in Apuseni Natural Park, CÃ¢mpani, Bihor County, Romania. It contains the oldest known cave paintings of Central Europe, radiocarbon dated to 32,000 and 35,000 BP, corresponding to the Aurignacian and Gravettian cultures of the Paleolithic period. The Coliboaia Cave was first mentioned in history before 1900, but it was never extensively investigated until 1981 by Gabor Halasi. This cave was not well known until September 2009, when they found prehistoric cave paintings. It then became protected by the Romanian Federation of Speleology. Situated on a western slope of Sighestel Valley, the cave sits at an altitude of 560 meters. It has a medium sized entrance and a portal that is oriented east to west. OXFORD, ENGLANDâ€”It had been previously believed that the first rice grown in northern China, Japan, and on the Korean peninsula was only of the sticky japonica variety, which requires cultivation in dry fields. But a team led by Masahiko Kumagai of the University of Tokyo obtained DNA from carbonized rice ranging in age from 900 to 2,800 years old found at archaeological sites in Japan and Korea. The scientists then compared the genomes of the ancient rice samples to a database of more than 200 cultivated and wild rice DNA samples from around the world. They found that some of the ancient grains seemed to be more similar to the indica variety of rice, which has a long grain, grows submerged in water, and is usually associated with the tropics. This suggests that the crops were moved long distances. Michael Purugganan of New York University told The Christian Science Monitor that early farmers may have tried to grow â€œeverything they could get their hands on,â€� until they developed a crop that adapted well to the environment. To read about the earliest evidence for tea drinking in China, go to "The Price of Tea in China." Scientists sequenced the DNA of ancient grains of rice from Japan and the Korean peninsula in search of clues into the mysterious history of the staple food. The rice farmed in archaic Japan and on the Korean Peninsula was surprisingly diverse, according to the team's paper published Tuesday in the journal Molecular Biology and Evolution. And this suggests that the cultivated crops were being moved long distances. Understanding that rice could have been being traded among far-flung civilizations over 2,000 years ago could help scientists better understand how domestic rice has evolved. "The picture we're getting is that the story of rice is much more complicated than we had originally thought," Michael Purugganan, the Dean for Science at New York University who was not part of the study, tells the Monitor in a phone interview. The Vikings might have been fearsome, bearded and hardy but it seems that when it came to horses, they liked to travel in comfort. Research has revealed that the genetic mutation for a smooth ride first appeared in horses in medieval England and was later spread around the world by Viking traders. Described, for riders, as being akin to sitting in a comfy chair, ambling gaits are particularly suited to lengthy rides over rough roads. But while all horses can walk, trot and gallop, the ability to amble is only found in certain breeds of horses, among them the Icelandic pony. The trait, as the scientists had previously discovered, is down to a mutation in a single gene, a genetic variant dubbed the â€œgait keeperâ€�, which also allows horses to adopt another gait - the pace. Now the team have discovered where and when the mutation first appeared. â€œAs far as we know today, ambling horses originated in early medieval England and spread around Eurasia within a few centuries,â€� said Arne Ludwig, lead author of the research from the Leibniz Institute for Zoo and Wildlife Research in Berlin. Writing in the journal Current Biology, the international team of researchers describe how they looked at ancient DNA from 90 horses that lived between 6000 BC and 1000 AD in countries across Europe and Asia. The researchers found that there was no trace of the gait keeper mutation in horses that lived before the 9th century AD, with its first appearance cropping up in two English horses that lived in York around 850-900 AD. Instead, they suggest that the trait first appeared in English horses which were then taken to Iceland and later distributed around the world, with these horses selectively bred because of their comfortable gait - a boon in the days of rough tracks and long journeys on horseback. The spread of the trait, was most likely down to the Vikings, who not only had a strong presence in York and other regions in the north of England during the late 9th and early 10th centuries, but also settled in Iceland and had established trade routes to many other countries. â€œThus ambling horses might have been introduced to Asia by Vikings during their journeys to the Caspian Sea and the Middle East,â€� the authors write. Horseback riding is the most fundamental use of domestic horses and has had a huge influence on the development of human societies for millennia. Over time, riding techniques and the style of riding improved. Therefore, horses with the ability to perform comfortable gaits (e.g. ambling or pacing), so-called â€˜gaitedâ€™ horses, have been highly valued by humans, especially for long distance travel. Recently, the causative mutation for gaitedness in horses has been linked to a substitution causing a premature stop codon in the DMRT3 gene (DMRT3_Ser301STOP)  . In mice, Dmrt3 is expressed in spinal cord interneurons and plays an important role in the development of limb movement coordination  . Genotyping the position in 4396 modern horses from 141 breeds revealed that nowadays the mutated allele is distributed worldwide with an especially high frequency in gaited horses and breeds used for harness racing  . Here, we examine historic horse remains for the DMRT3 SNP, tracking the origin of gaitedness to Medieval England between 850 and 900 AD. The presence of the corresponding allele in Icelandic horses (9thâ€“11th century) strongly suggests that ambling horses were brought from the British Isles to Iceland by Norse people. Considering the high frequency of the ambling allele in early Icelandic horses, we believe that Norse settlers selected for this comfortable mode of horse riding soon after arrival. The absence of the allele in samples from continental Europe (including Scandinavia) at this time implies that ambling horses may have spread from Iceland and maybe also the British Isles across the continent at a later date. The discovery places the lifespan the Greenland shark far ahead of even the oldest elephant in captivity, Lin Wang, who died aged 86. It is also far longer than the official record for humans, held by 122-year-old Frenchwoman Jeanne Louise Calment. â€œIt kicks off the bowhead whale as the oldest vertebrate animal,â€� said Julius Nielsen, lead author of the research from the University of Copenhagen, pointing out that bowhead whales have been known to live for 211 years. 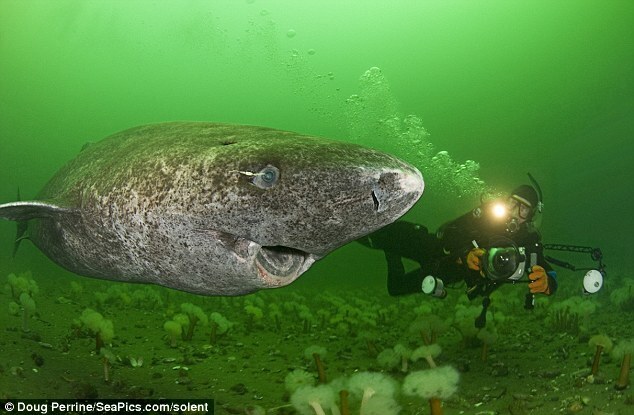 But the Greenland shark doesnâ€™t scoop all the gongs - the title of the worldâ€™s longest lived animal is held by Ming, an Icelandic clam known as an ocean quahog, that made it to 507 years before scientists bumped it off. The temporary closure has been ordered because of Â­dangers in accessing the site, with visitors using its car park having to cross one of the Orkney mainlandâ€™s busiest roads. HES has been monitoring safety issues relating to vehicle movements around the 5,000-year-old tomb and the neighbouring 19th century Tormiston Mill, and concluded there are significant risks to staff and visitors that cannot currently be overcome. Maeshowe (or Maes Howe; Norse: Orkhaugr) is a Neolithic chambered cairn and passage grave situated on Mainland, Orkney, Scotland. It was probably built around 2800 BCE. 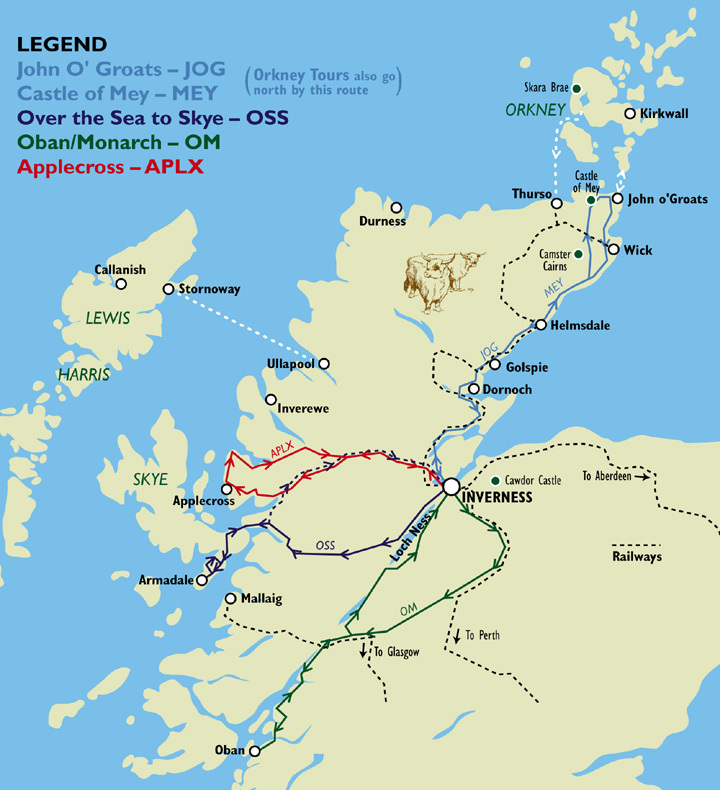 It gives its name to the Maeshowe type of chambered cairn, which is limited to Orkney. Maeshowe is a significant example of Neolithic craftsmanship and is, in the words of the archaeologist Stuart Piggott, "a superlative monument that by its originality of execution is lifted out of its class into a unique position." 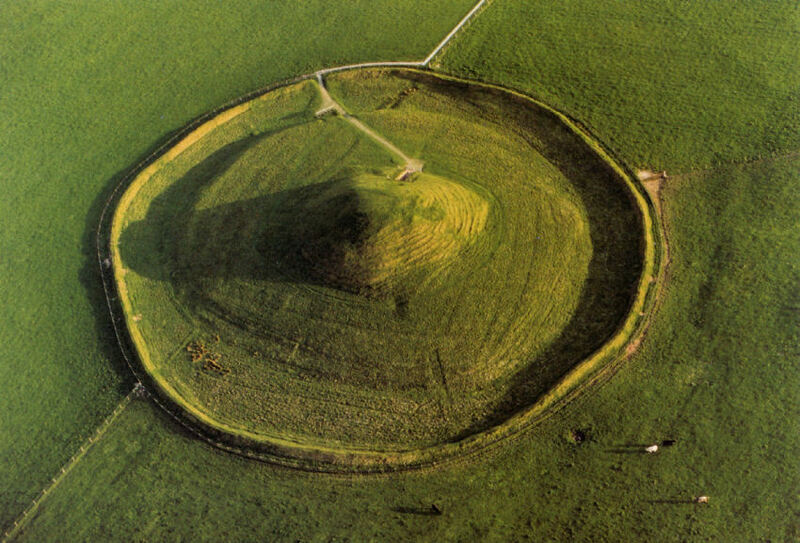 The monuments around Maeshowe, including Skara Brae, were designated a UNESCO World Heritage Site in 1999. There was a great article posted over at the Guardian website on the weekend written by Robin Mckie, who travelled north to uncover the treasures on offer in Neolithic Orkney â€“ which are estimated to have been formed before Egyptâ€™s pyramids. What is clear is that the cultural energy of the few thousand farming folk of Orkney dwarfed those of other civilisations at that time. In size and sophistication, the Ness of Brodgar is comparable with Stonehenge or the wonders of ancient Egypt. London may be the cultural hub of Britain today, but 5,000 years ago, Orkney was the centre for innovation for the British isles. Ideas spread from this place. The first grooved pottery, which is so distinctive of the era, was made here, for example, and the first henges â€“ stone rings with ditches round them â€“ were erected on Orkney. Then the ideas spread to the rest of the Neolithic Britain. This was the font for new thinking at the time. The people of the Neolithic â€“ the new Stone Age â€“ were the first farmers in Britain, and they arrived on Orkney about 6,000 years ago. They cultivated the land, built farmsteads and rapidly established a vibrant culture, erecting giant stone circles, chambered communal tombs â€“ and a giant complex of buildings at the Ness of Brodgar. The religious beliefs that underpinned these vast works is unknown, however, as is the purpose of the Brodgar temples. "This wasn't a settlement or a place for the living," says archaeologist Professor Colin Richards of Manchester University, who excavated the nearby Barnhouse settlement in the 1980s . "This was a ceremonial centre, and a vast one at that. But the religious beliefs of its builders remain a mystery." The original shrine to a Viking-king-turned-saint has been discovered in Norway, archaeologists say. The site is in Trondheim, where Olaf was buried after his death in battle. After locals began circulating stories about miracles credited to the dead king, his grave was opened, and his body was found to be miraculously well preserved, according to church teachings. The local bishop declared him a saint and reinterred his body in St. Clement's Church. It's this church that NIKU archaeologists believe they have now uncovered. They found stone foundations, and even a small rectangular platform made of rock on the building's east end, believed to be the base of the church's altar. This altar may have been the High Altar of the church built over St. Olaf's new grave. "This is a unique site in Norwegian history in terms of religion, culture and politics," excavation director Anna PetersÃ©n said in a statement. "Much of the Norwegian national identity has been established on the cult of sainthood surrounding St. Olaf, and it was here [where] it all began!" The pope would confirm St. Olaf's local canonization as a saint in 1164. Olaf's run in power crumbled soon after, when the then-king of England and Denmark, Canute I, resolved to reconquer Norway. Olaf was forced to flee to Russia in 1028; he returned in 1030 to try to win back the throne, but died instead. Some contemporary sources report that he was murdered or unceremoniously killed in an ambush. The Norse saga Heimskringla, which was written 200 years after the fact, tells a more valorous tale of the king leading an army into battle and dying in hand-to-hand combat, with Thorir Hund, one of the leaders of the resistance to Olaf's reign, delivering the final death blow. However, when engineers studied animal carvings made on a pillar â€“ known as the vulture stone â€“ at Gobekli Tepe they discovered that the creatures were actually astronomical symbols which represented constellations and the comet. AUTHOR: ERIC NIILER. ERIC NIILER SCIENCE DATE OF PUBLICATION: 04.26.17. IN 1993, CONSTRUCTION workers building a new freeway in San Diego made a fantastic discovery. A backhoe operator scraped up a fossil, and scientists soon unearthed a full collection of bones, teeth, and tusks from a mastodon. It was a valuable find: hordes of fossils, impeccably preserved. The last of the mastodonsâ€”a slightly smaller cousin of the woolly mammothâ€”died out some 11,000 years ago. But the dig site turned out to be even more revelatoryâ€”and now, with a paper in the journal Natureâ€”controversial. See, this site wasnâ€™t just catnip for the paleontologists, the diggers who study all fossils. It soon had archaeologists swooping in to study a number of stone tools scattered around the bones, evidence of human activity. After years of debate over the dating technology used on the mastodon, a group of researchers now believes that they can date it and the human tools to 130,000 years agoâ€”more than 100,000 years earlier than the earliest humans are supposed to have made it to North America. The researchers expect a bit of controversy from a discovery that pushes back the arrival of humans in North America by a factor of ten. Nature itself put together this video featuring a leading British critic of the paper. Still, lead author Steven Holen, co-director of the Center for American Paleolithic Research is confident that his colleagues have done their homework. â€œI was skeptical myself,â€� he says. â€œBut itâ€™s definitely an archaeological sit. An archaeological site in California may have opened up a whole new chapter in the history of humans in the Americas. Researchers claim the site shows evidence of humans interacting with the bones of a mastodon, an ice age relative of elephants and mammoths. New dating suggests the site may be 130,000 years old â€“ 100,000 years earlier than the accepted date for the first human colonisation of the Americas. 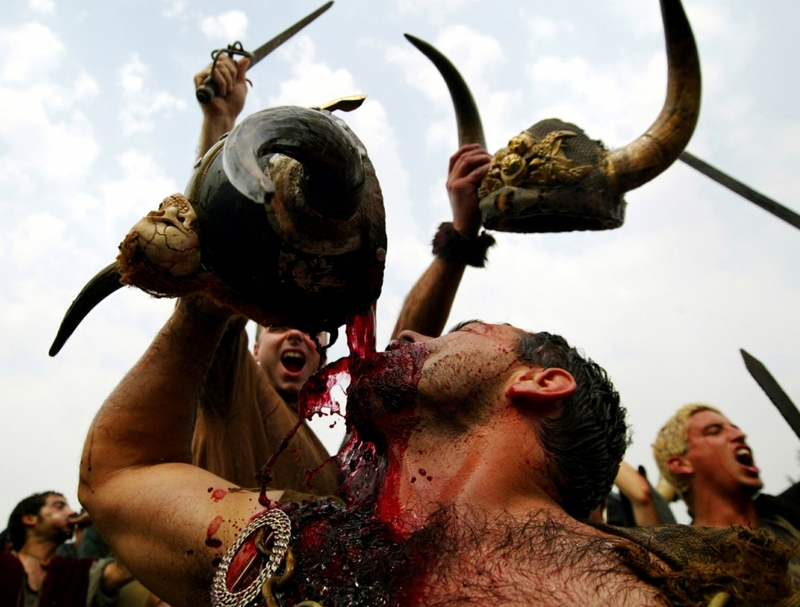 Nordic and Viking civilisations drank an "extreme hybrid beverage" known as Grog around 3,500 years ago, scientists have discovered. Nordic people created an alcoholic drink made from local ingredients such as honey, bog myrtle, juniper, resin and barley, as well as grape wine imported from southern or central Europe. Published in the Danish Journal of Archaeology, researchers led by Patrick E. McGovern, from the University of Pennsylvania Museum of Archaeology and Anthropology, found evidence of this ancient boozy beverage inside pottery and bronze drinking vessels and strainers from sites in Denmark and Sweden. Henriksen himself discovered the two centuries-old wine pips in a sample of earth at the site of a Viking settlement at TissÃ¸. Analysis of the pips found one to date from the Viking era and the other from the Iron Age. â€œBefore we only had suspicions, but now we can see that they actually had grapes and therefore the resources to produce [wine] themselves. Suddenly it all becomes very real,â€� professor Karin Margarita Frei of the National Museum told Videnskab.dk. Stone spearpoints from roughly 15,000 years ago suggest that descendants of some of the earliest American settlers went on to create the Clovis culture. Excavations at a site in Central Texas yielded about 100,000 stone artifacts, including 12 spearpoints, that date to between 15,500 and 13,500 years ago. The shapes of those spearpoints show a progression from stemmed points to a short triangular blade, meaning that the artifacts may have been precursors to long, triangular Clovis points, researchers report October 24 in Science Advances. By about 13,500 years ago, Clovis people had settled various sites across North America. For years, scientists thought that these people were the first inhabitants of the continent. But researchers have found a growing number of pre-Clovis human sites in the Americas (SN: 8/4/18, p. 7). In 2011, initial pre-Clovis finds were unearthed at the Buttermilk Creek Complex, part of the larger Debra L. Friedkin archaeological site and the same place where the newly discovered artifacts come from. But none of those finds could be linked to later Clovis points also from the site. In the new study, the researchers show that 11 of the 12 new spearpoints had been chipped into leaf shapes that taper into slightly narrower stems. The exception is a short, triangular spearpoint with a flat base that dates to between 14,000 and 13,500 years ago. ?We have discovered two previously unknown spearpoint styles that predate Clovis,? says study coauthor and archaeologist Michael Waters of Texas A&M University in College Station. Finding these artifacts in sediment showing a clear progression from stemmed points to a triangular point to Clovis points over a roughly 2,000-year period raises the likelihood that one spearpoint style led to the next, Waters holds. ?At least in Central Texas,? Halligan says, ?people arrived well before Clovis, discovered a source of excellent stone for tools and passed their knowledge on to their descendants who eventually started making Clovis artifacts.? Iberian Megalithic Tombs: 6,000-Year-Old Lensless Telescopes? A team of astronomers from the UK is exploring what might be described as the first astronomical observing tool, potentially used by humans around 4,000 BC. The team, led by Dr. Fabio Silva of the University of Wales Trinity Saint David, suggests that the long, narrow entrance passages to Iberian megalithic tombs from the Middle Neolithic period may have enhanced what early human cultures could see in the night sky. The team?s idea is to investigate how a simple aperture, for example an opening or doorway, affects the observation of slightly fainter stars. The scientists focus their study on passage graves, which are a type of megalithic tomb composed of a chamber of large interlocking stones and a long narrow entrance. These spaces are thought to have been sacred, and the sites may have been used for rites of passage, where the initiate would spend the night inside the tomb, with no natural light apart from that shining down the narrow entrance lined with the remains of the tribe?s ancestors. The city of Le?n was founded by the Roman Seventh Legion (usually written as Legio Septima Gemina ("twin seventh legion"). It was the headquarters of that legion in the late empire and was a centre for trade in gold, which was mined at Las M?dulas nearby. Le?n fell again, this time to the Moors. However, Le?n was one of the first cities retaken during the Christian reconquest of the Iberian peninsula, and became part of the Kingdom of Asturias in AD 742. The taking of Toledo, the old Visigoth capital, in 1085 by Alfonso VI of Le?n was a turning point in the development of Le?n and Castile and the first major milestone in the Reconquista. Beginning with the Vth century, many Spanish writings support the idea that the fourth colonization of Spain by the Goths, considered to be in fact the ancient Getae (?Getae illi qui et nunc Gothi? ), has led to the foundation of the Spanish nation and of the Iberian state. Throughout the following centuries, this legend gathered momentum, becoming an actual historical, cultural and moral reference for the Spanish society. The Swedish also boast in their stories that the laws upon which their state and culture rely, are the laws of Zamolxis! Like any rational individual residing in a mioritic space, I wondered: are these nations off the track or is it that our realms reeks of infamy? In order to understand why the Spaniards spread such stories, we need to search carefully our ancient history, forged with so much resentment by the would-be mentors of our people! To the same effect, a great part of the answer to this question can be found on the lead plates concealed by the embittered employees at the Institute of Archaeology in Bucharest. The Romanian historians who knew a thing or two about Getica of Jordanes cut it short, saying that the author of Gothic origin made a confusion between the Getae who destroyed the Roman Empire and the Goths who came to our lands during the second and third century AD. Their ?farsighted? sayings remained deep-rooted and iron-bound for centuries to come. Still, these far-fetched ideas aren?t even stated anymore in the history books, to keep people from wondering if the reasoning is correct or it is plain raving. On the tombs of the Visigoth kings in Old Castile, stands written for posterity: ,,Rex Godorum et Dacorum et Gaetorum et Hispaniae Rex?, meaning for our understanding ?king of the Goths, of the Dacians, of the Getae and king of Spain?! Did these kings not even know who their subjects were, or should the wretched fellows from the mioritic lands should receive a ?decoration of talent? for high treason against their nation and country? I will give one more example to show who they really are and how much evil they did to the Romanian people! In a document from 615 called Libbelus dotalis Morgingeba (Morgingeba?s Wealth Register), the Visigoth chieftain writes that their state was based upon ?,?ordinis ut Getici est et Morgingeba uetusti? (?practices as of Getae and also used by Morgingeba?) meaning he writes and also leaves a testimony about leges bellagines. In the same document the author mentions the Visigoths received nobiliary titles, ? ?Insigni merito et Geticae de stirpe Senatus? (Honoured with military merits and Getae senatorial rights, following the example of Constantine the Great, who ennobled many barbarian knights that had proven worthy in the use of weapons). Christian Mozarabs from Al-Andalus had come north to populate the deserted frontier lands, and the traditional view of Spanish history has been that they brought with them the remains of Visigothic and Classical culture, and a new ideology of Reconquista, a crusade against the Moors. In the Irish mythology, Danu or Dana in modern Irish was the mother goddess of the Tuatha de Danaan, meaning those of Irish origin or ?the people of the goddess Danu?, another people descended from gods like the Getae. The Egyptians say that amongst the ?sea people? who invaded them in search of loot, were also the ?Daniuna?, while Virgil writes in chapter II,49 of Aeneid about the people of ?Danaos? or ?Danaans?, the ancient inhabitants of Peloponnesus, who caused great sorrow to the stronghold of Troy, but we don?t know if this happened before or after the visit to Egypt. During the Late Bronze Age and the Iron Age, Tartessos had strong trading connections with the British Islands and the Ancient Ireland, because these territories had the necessary metals to produce bronze and iron objects. The region that was flooded and covered by mud and sand where the ancient Tartessos used to be, is nowadays a special reservation called Do?ana National Park, a lexical reminiscence of the ancient natives Danaan, since the two highlighted words belong to the same lexical family. A comparative study between the Emegi language, the old Romanian language and the Hispanic languages would reveal treasures that would cause great chagrin to the Latinists and the defenders of the Indo-Germanic theory. Hebrews have no place on this pure land which doesn?t allow revelations and diabolical visions. After this research through the Antiquity blackened by the fog of oblivion, but mostly by the people?s incommensurate hate, allow me to get back to the Spanish medieval writers who left us noteworthy data and facts regarding our true history and culture. Alonso de Cartagena (1384-1456), who lived in the days of Henry IV, wrote that the kings of Spain descended from Dacian princes, taking only their names from the place where they lived, because they were more illustrious than those of their ancestors; he also says that the name Geta can be found in the medieval writings as a nobiliary title. In our language, the same word is meant as an insult and an expletive! The Getae symbols appear in the blazonry of the Spanish kings ? the arrows which terrified the world and the yoke as a proof that they were rich in cattle. If Orosius said that the Getae were the Goths who conquered Spain, two centuries later Isidore asserted the identity of the Getae with the Goths and over the ensuing centuries, the scholars, as well as the ruling class had to demonstrate their Getic lineage in order to prove that they were of noble blood. From Isidore of Seville, the legend evolved, taking roots in all the chronicles; thus, a fragment of the Getae history surprisingly entered the history of Spain itself. The Getae names Boruista/Buruista, Diurpaneus, Decebalus, Zamolxis and Deceneus can be found in Saint Isidore?s works, in the writings of the archbishop Rodrigo Jimenez de Rada and at King Alfonso el Sabio, occupying their rightful place in the genealogy of the Spanish people. Liuvigild, Leuvigild, Leovigild, or Leovigildo (Spanish and Portuguese), (c. 519 ? 21 April 586) was a Visigothic King of Hispania and Septimania from 568 to April 21, 586. From 585 he was also king of Galicia. Known for his Codex Revisus or Code of Leovigild, a unifying law allowing equal rights between the Visigothic and Hispano-Roman population, his kingdom covered modern Portugal and most of modern Spain down to Toledo. He was born circa 525. In 582 Liuvigild captured M?rida, which had been under the political control of its popular bishop Masona since the early 570s. Masona was soon after exiled for three years, possibly in the context of the rebellion of Hermenegild.